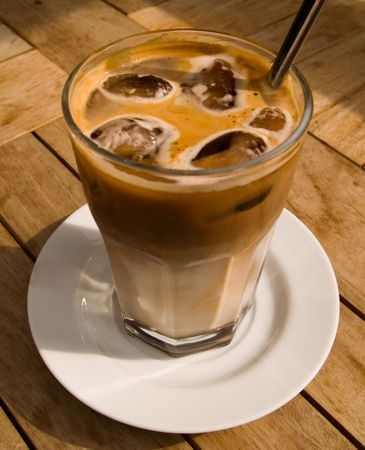 A great iced coffee was never made using stale beans so avoid buying your beans on sale. If you don’t drink iced coffee often, consider buying fresh beans at a coffee shop where you can buy only the amount you need for the occasion. Hot coffee tastes different than cold coffee. So to get an idea of how your coffee will taste cold let a hot cup cool to room temperature. This little test will help you decide what tastes perfect to you. Ice has a tendency to get a stale if it sits in the freezer unused for too long. If you’re wondering whether your ice is helping of hurting your iced coffee, it’s easy to test: let a few cubes melt and come to room temperature, then taste the resulting water. If it’s water you would want to drink by the glassful, you’re in good shape. If not, toss out the old ice and make fresh. If it still tastes stale, buy a bag of ice, the cost is worth the boost in flavor. Brew your coffee on the strong side as it will be weakened by the ice. To keep from diluting your drink, brew a pot of coffee and freeze into ice cubes. Use frozen coffee cubes in place of regular ice cubes to keep from diluting or weakening the flavor. Some people object to acidity in their cold coffee. Cold brewing greatly reduces the acid content of coffee, it will lower the acidity one full pH point verse hot brewed coffee. Put 3/4 cup ground coffee in a quart Mason jar, fill with water and stir. Cap it and put in the refrigerator for 12 hours. Strain the resulting concentrate through a coffee filter to remove the grinds. Add water to taste when you’re ready to drink. You can even heat the reconstituted beverage for a quick, low-acid cup of hot coffee. Saving leftover coffee for iced beverage is often fine, but don’t be tempted to use the dregs of a burnt pot. If it doesn’t taste good hot, it definitely won’t taste good cold. Adding fruit flavors such as strawberry, orange, blueberry, cherry and even spices like nutmeg, cinnamon or cardamom are a great way to perk up your coffee drink. The important thing is to have fun with it! Try lots of new things. Vary your usual routine. The worst that can happen is you won’t like it. You can always try something else! CoffeFilter: What are your best tips to help quit drinking coffee? This entry was posted in Beverages and tagged Beverages, Coffee, Cold brew, Drink, Home, Ice cube, Iced coffee, Taste. Bookmark the permalink.